Sheet: 24.5" x 31.5", Design: 21.5" x 27.5"
Our Jacobean Wall Stencil is our take on a timeless classic pattern that never goes out of style! This floral vine stencil features stylized fruits and flowers, growing along elegant vines. This is a perfect wall pattern for bedrooms, kitchens and even nurseries. 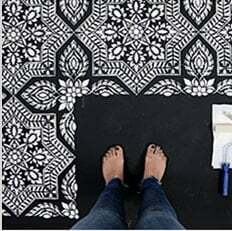 Try stenciling it in back over white for a striking classy look, or get creative with your stencil brushes and fill it with multiple colors! Stencil features an easy registration system, just use parts of the previously painted design to align the stencil, check for level and continue. This gives you a seamless "wallpaper" look. Don't worry about super perfect alignment: in the end your eye will never ever notice the discrepancy.